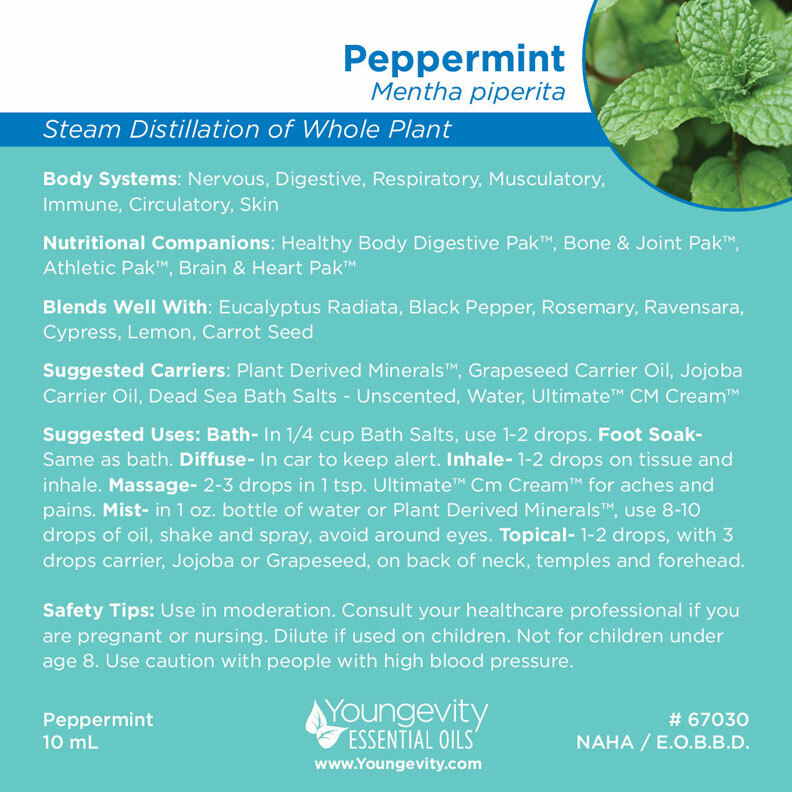 Peppermint Essential Oil is a 100% pure, therapeutic essential oil produced with the highest level of standard and safety. Steam-distilled or cold pressed with non-destructive techniques to extract and preserve the integrity of the essence. Peppermint is best known for aiding in digestion. It generally helps to reduce gas, bloating, and relieve an upset stomach but is also excellent for relieving headaches and stress. A mental and physical stimulant, it may help to stay alert during long working hours or while driving. It may also help reduce fevers, and give immediate relief for minor injuries, such as a smashed finger. Safety Notes: Not recommended for children under 2 years. Used in moderation, it is non-toxic, and non-irritating. Not recommended for those who suffer from atrial fibrillation. Not recommended for use in conjunction with homeopathic remedies as it may neutralize the benefits. Use cautiously with high blood pressure. Youngevity Essential Oils come from the most respected and ethical distillers, free of additives, extenders or chemicals; delivering the purest, authentic essential oil. Each essential oil is organic, wild-crafted or ethically farmed. Sign up for Coupon Codes!